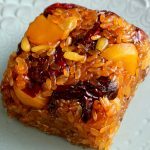 Yaksik is a kind of Korean rice cake made with glutinous rice, honey, nuts, and dried fruits. It’s a sweet, delicious treat that’s packed full of flavor and healthy ingredients. Even the name is healthy – in Korean, yak means “medicine,” and sik means “food.” Koreans have long believed that honey is a medicine that’s beneficial to your health, so anything with honey is good for you. We feel the same way about jujubes and pine nuts, too, so yaksik is good for you. It’s also delicious! Like many Korean housewives, I used to make yaksik in my pressure cooker. It’s very easy to do: just mix in all the ingredients, turn the pressure cooker on, and let it get to work. How to make yaksik with a pressure cooker is below. But yaksik made in a pressure cooker can’t be compared with the taste and texture of yaksik made the traditional way. Each grain of rice becomes firm and chewy rice cake, and the flavors of all the ingredients are more distinct and alive. Whichever way you decide to make it, I guarantee you’ll love this delectable, delightful snack. I make a lot of them and then save them for my breakfast or snack, but they are delicious any time of day. Enjoy my recipe! Let me know how your yaksik turns out. Add the sugar and 2 tablespoons water to a small saucepan on high heat. Don’t stir, or the sugar might crystallize. When it starts to boil, move the pan around to mix it up. 6 minutes later it will start to bubble. Turn the heat down low and swirl the sauce around in the saucepan to mix it up. 2 minutes later, when it gets a little smoky and turns dark brown, remove from the heat. Add 2 tablespoons of water and tilt and move the pan so it all mixes well. Let it cool. Combine the brown sugar, oil, soy sauce, sesame oil, and cinnamon powder in a small bowl, stirring with a wooden spoon until all the sugar is dissolved. Combine jujubes, raisins, pine nuts, chestnuts, and the dried cranberries (if used) in a large bowl. Strain the rice. Put into a steamer basket lined with a cotton cloth. Cover the rice with the edges of the cotton cloth. Add 5 cups of water to the steamer, cover and cook for 40 minutes over medium high heat. Open and turn the rice over a few times with a wooden spoon so it cooks evenly. Lower the heat to medium and cook another 20 minutes. 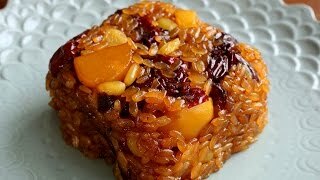 Transfer the cooked rice to the large bowl with the fruits and nuts. Add the seasoning sauce, caramel sauce, and honey. Mix well with a wooden spoon until all the liquid is absorbed by the rice. Put everything back into the steamer basket lined with the cotton cloth. Cover with the edges of the cotton cloth, add 1 cup of water to the steamer, and cook for 30 minutes over medium heat. Put the hot steamed yaksik into a 8 x 8 inch baking pan lined with plastic wrap. Mix well with a wooden spoon so the fruits and nuts get evenly distributed through the rice. Pack it down slightly so it all sticks together. Let it cool for about 20 minutes and flip the pan upside down over a cutting board so the rice cake comes out. Cut into 9 even size pieces. Wrap each one in tightly plastic wrap, into squares. Put the wrapped yaksik into a plastic bag and freeze up to 1 month. When you want to eat one, take it out of the freezer and microwave for 2 minutes, or thaw it out at room temperature for about 30 minutes until it’s soft and chewy again. Put 2 cups of washed and drained rice in a pressure cooker. No need to soak it. Add the caramel sauce, seasoning sauce, honey, jujubes, raisins, pine nuts, chestnuts, and the dried cranberries (if used). Add 1 cup of water and set the pressure cooker to make rice. Posted on Tuesday, April 21st, 2015 at 12:17 am. Posted November 2nd, 2017 at 1:41 am | Log in to reply. I tried this recipe this morning and share with my boss and workmate. Thank for your recipes and wait for more. Posted November 7th, 2017 at 8:10 am | Log in to reply. Posted December 31st, 2015 at 2:47 pm | Log in to reply. Hello Maanchi! :) I love watching your videos!! I tried making this recipe (and am actually in the process currently), but when I steamed the rice, all of the water vanished before the first forty minutes was up and now my pot is melted to the stove. O.O; I followed your directions and added five cups of water to my steamer pot with two cups of sweet glutinous rice wrapped in cheesecloth. But I did something very wrong and I don’t know what. D: Any thoughts? Posted December 31st, 2015 at 3:13 pm | Log in to reply. Everybody’s stove has different heat, so you will need to adjust for that. Add more water and lower the heat and cook longer until the rice is fully cooked. Good luck! Posted December 31st, 2015 at 3:15 pm | Log in to reply. Posted December 22nd, 2015 at 6:20 am | Log in to reply. Amazingly delicious! I’ve bought this many times and I’m so happy to be able to make it myself now! I made it in our rice cooker and it turned out great, though it’s not a regular rice cooker and has different functions. This is such a great winter snack for my children, they’re gobbling it up as I write this! Posted December 24th, 2015 at 9:32 am | Log in to reply. I’m happy to know that you made delicious yaksik with your rice cooker. I think your rice cooker is a pressure cooker. Posted September 18th, 2015 at 11:35 pm | Log in to reply. Can a different rice (short grain”sushi”) be used instead? Posted September 20th, 2015 at 1:51 pm | Log in to reply. Posted August 9th, 2015 at 2:26 pm | Log in to reply. Can you use roasted chestnuts? I have a bag of roasted chestnuts. What can I use in lieu of a steam basket or a pressure cooker? Posted June 30th, 2015 at 8:24 am | Log in to reply. Posted June 30th, 2015 at 10:10 am | Log in to reply. You can make it just as you make your rice. Posted June 30th, 2015 at 3:12 am | Log in to reply. Annyeong Maangchi this recipe was more delicious than I anticipated. I made the recipe for my mom but didnt use chestnuts(couldnt find) jujubes(i know she doesnt like them) and pine nuts (very expensive where Im from) but used pecans, almonds, cranberries and dark raisins. She loved it and told me to thank you! Posted June 30th, 2015 at 10:31 am | Log in to reply. yes, pine nuts are expensive everywhere! : ) You made awesome yaksik with available ingredients! Congratulations! Posted May 23rd, 2015 at 11:43 am | Log in to reply. Do you have a recommended substitute for the canned chestnuts, or would you recommend just leaving them out? I’ve looked in several Asian market close to where I live and can’t find them anywhere. Posted June 22nd, 2015 at 3:04 am | Log in to reply. Since I couldn’t find the canned chestnuts, I used other items. I used about 1 cup of cranberries, 1/2 cup of chopped pecans, 2 Tbsp of golden raisins, 2 Tbsp of chopped dates & 2 Tbsp of pine nuts. I think it turned out pretty well. I think slivered almonds would work well also. Posted June 22nd, 2015 at 3:48 pm | Log in to reply. It looks sweet and chewy! Congratulations! Posted May 3rd, 2015 at 8:39 pm | Log in to reply. Can we use regular rice cooker for this recipe? If so, how much water? Posted May 3rd, 2015 at 8:46 pm | Log in to reply. I think you should use a pressure cooker. Posted May 14th, 2015 at 7:34 am | Log in to reply. If we use a pressure cooker, can you tell us how to adjust the recipe? What settings etc? Thanks! Posted May 14th, 2015 at 10:14 am | Log in to reply. Check out “How to make yaksik in a pressure cooker” in the recipe, please. OH my goodness, I’m so sorry I missed that at the bottom! Thank you :) Would you say the quality turns out as tasty either way it’s made? Posted May 3rd, 2015 at 11:19 am | Log in to reply. Is it possible to use a rice cooker instead of a pressure cooker? Posted April 29th, 2015 at 1:34 am | Log in to reply. Maangchiiiiiiii! How do you eat such delicious rich foods and stay so lovely and slim?? What’s your secret? I feel my jeans getting tighter already haha! Posted April 29th, 2015 at 10:21 am | Log in to reply. Posted May 3rd, 2015 at 6:13 am | Log in to reply. You’re right, portion control is very important. It’s just so hard with your delicious food lol! Maangchi, next time you’re in London, you have to visit me!!! I live 10 minutes away from Korea Town (New Malden) with a huge H-Mart and everything you would ever need for Korean cooking. It would be a pleasure and an honour to host you and to cook with you. Let me know when you’re coming!! Posted April 26th, 2015 at 11:29 pm | Log in to reply. Posted April 23rd, 2015 at 3:31 pm | Log in to reply. I made this and it was out of this world. Completely blew me away! Maangchi you’re a genius and a brilliant teacher!! Posting pics soon yay! Posted April 23rd, 2015 at 3:36 pm | Log in to reply. omg! I can’t wait to see the photo! Posted April 21st, 2015 at 5:18 pm | Log in to reply. Yay!!! You NEVER fail me, ever! This is by far my favorite Korean dessert recipe!!!! I need to try this soon~~~thanks so much! Posted April 23rd, 2015 at 10:54 am | Log in to reply. Posted April 21st, 2015 at 2:58 am | Log in to reply. This recipe was originally posted on April 21, 2015 at 12:17 am by Maangchi. The video was watched 790,218 times on YouTube & has 11,820 likes!